Ask a girl if she were only allowed one item on a dessert island what it will be and you’ll find many will say, mascara, lip gloss or a toothbrush. I asked Darren, my boyfriend, and he said an avocado– he said “it’s really the perfect food”. (Admittedly, I asked about one item or one food). Actually, if you really think about it, he’s right, after all, avocados are rich, creamy and delicious and have over 20 nutrients. Plus they are rich in good-for-you monounsaturated fats which enhance the absorption of the caretonoids, which protect our cells from the damage that is part of the aging process–and from cancers, woohoo!. Plus, avocados contain the magical skin and hair nourishing ingredients (check these out and what the recipe does for you below!). Needless to say I knew I had to include an avocado in his birthday dessert ;). Yes, he spotted the chocolate, cacao powder and avocado—“choc-amole”. Gosh, he’s cute ;). But what Darren didn’t realize was that while avocado is responsible for the oh-so-creamy texture, the cocoa powder adds that rich and decadent chocolate sensation—and together they create this super light, rich and fluffy mousse! Guac-Chocolate Mousse. And while your taste buds bask in mousse heaven, this Guac- Chocolate Mousse actually does quite a number of amazing things for your body! magical skin nourishing ingredients–antioxidants like vitamin C, beta-carotene and Vitamin E from the avocado. Avocado’s mono-unsaturated fat acts as an additional nourishing lotion for the skin. And from the cocoa powder—the benefits!– cocoa flavanols support healthy circulation. This means that aside from promoting cardiovascular health, they improve the flow of oxygen and nutrients to all parts of the body, helping you to perform and feel your best while nourishing your skin, eyes, muscles and all parts of your body—and who doesn’t want a gorgeous complexion, energized muscles and a strong heart?! We certainly do! Melt the chocolate chips in the microwave for a minute with a microwave safe bowl. Then at 15 second intervals, to prevent burning, microwave adding splashes of water as needed to keep the consistency smooth until the chocolate is melted. 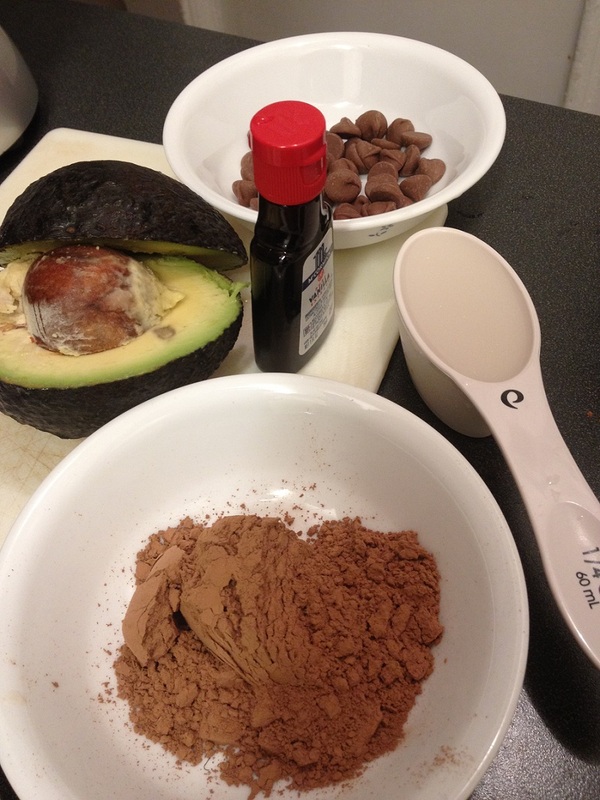 Add the melted chocolate to the blender, half of the almond milk and vanilla extract to the avocado. Blend ingredients together until smooth, adding in more almond milk if needed. Pour the creamy, rich , yet airy and light mousse evenly into small ramekins or bowls. You can eat as is, or freeze for a few minutes to eat chilled or store in fridge cool but sweet treat! While avocado is responsible for the oh-so-creamy texture, the cocoa powder adds that rich and decadent chocolate sensation—and together they create this super light, rich and fluffy mousse! Melt the chocolate chips in the microwave for a minute with a microwave safe bowl. Then at 15 second intervals to prevent burning, microwave adding splashes of water as needed to keep the consistency smooth until the chocolate is melted.